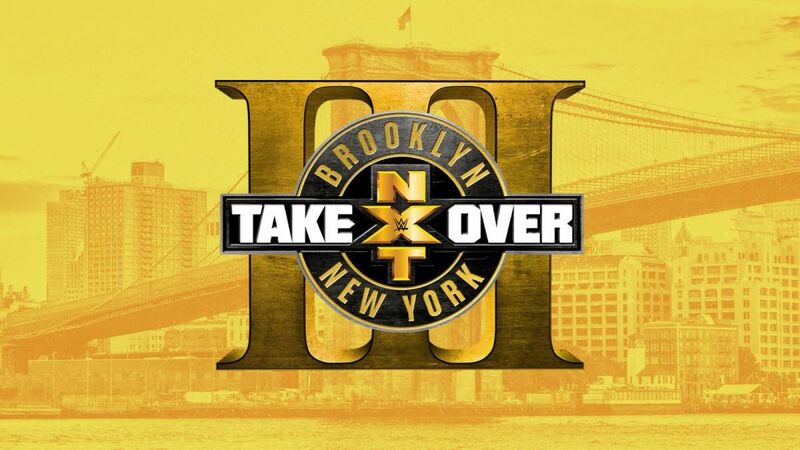 NXT returns to Brooklyn for what Triple H said is their version of Wrestlemania. No pressure, guys. WWE’s third brand prepares for its biggest show of the year with maybe the deepest, most talented roster they’ve ever had - one that is only getting deeper, Bay-Bay. The fact that established stars like Roderick Strong, Kassius Ohno, and Nikki Cross can’t even sniff getting on this card is a testament to just how stacked NXT is top to bottom. There is an argument to be made, that in terms of pure star power, this is the best Brooklyn TakeOver card ever and one of the best TakeOver lineups, period. Top to bottom, there one dud on the card, and every title could conceivably change hands. With so much uncertainty, and new talent possibly showing up, let’s run down the card match by match and see how many Adam Cole references I can make (one so far). What I would love is for Cien Almas to go somewhere in any type of capacity. Pairing him with Zelina Vega (FKA Thea Trinidad) is a good start towards developing his character, but he’s been in NXT since early 2016. Did it really take 18 months for them to say ‘Hey, maybe give him a valet?" To this point, he's kind of just been the handsome dude with great hair that loses almost every match. In his four appearances on TakeOver shows, he has lost to Aleister Black, Roddy Strong, and Bobby Roode and he's only beaten Tye Dillinger, back when Dillinger was the handsome dude that lost every match. It’s great to see Johnny Gargano back in NXT, where he is probably their best pure babyface since Sami Zayn. His story is pretty easy to tell; he gets betrayed by his partner and best friend, starts a singles run, and when he finally gets to the top, his partner comes back to ruin it. The Gargano/Ciampa feud that’s going to happen in like a year is going to be like 178 fire emojis, just the absolute best. If that’s the direction they go with Johnny ‘Sports Entertainment’ (shout out to everyone on Twitter I borrowed that from), then just have him lose here as people are still going to love him no matter what. They have a chance to make two guys in one match, especially if Almas doesn’t go over clean. I’m very into these two feuding for a couple months. But since the story is too easy, Gargano probably taps Almas in like eight minutes and I keep eating and enjoying my Triscuits and hummus. Hey, hi, hello NXT fans -- are you ready for the best match on the show? Just let these two cave each others' chests in with kicks and send everyone home happy. Itami has had the worst luck I can ever remember for someone with all his talent. Each potential push has had to be stopped because of serious fluke injuries. It’s just a shame that Aleister Black is going to kick his head off. I can’t believe how well Black’s character has gotten over considering he just knocks people’s heads off with a kick and then sits down criss-cross applesauce style. It’s a combination of his incredible look and style that makes everything he does feel like a big deal. Typically when someone gets the type of booking he has, one where he beats everyone, doesn’t talk, etc. It’s usually someone like Braun Strowman before he started talking and having the best lines ever, not someone ‘regular sized’ like Black is. It’s very cool to see. His entrance is very cool to see too, and might be even cooler if they do some kind of live performance to go with it. These two seem to match up so well on paper and both excel in all out sprint type matches. If we get 10-13 minutes, it could steal the show on the level Pete Dunne/Tyler Bate from the last TakeOver. Who are the fans supposed to be rooting for in this match? Both are essentially heel teams but still get cheered either because of how good the matches are and/or how captivating their personas might be. Apparently in house show matches, SAnitY are coming off as the faces, so let’s go with that -- the group that literally is about causing chaos and interferes in tons of matches as the good guys. I think the Authors of Pain have had great matches with everyone on every stage and are more than ready to get called up to the main roster. That's why I don’t mind putting the belts on SAnitY and letting AOP go up to Raw, which has exactly one heel tag team (Cesaro and Sheamus) worth any salt, so they certainly could use an infusion of talent. SAnity is really in a good spot to carry NXT’s tag team division right now. Outside of them and AOP, they're really isn’t a whole lot going on which means this is a perfect opportunity for them to have a long run as a dominant heel(-ish?) team. They would be a perfect feud for Bobby Fish and Kyle O’Reilly should WWE decide to reform their old tag team reDragon. They would even be a better match with the stable of ex-Ring of Honor talents that is rumored to soon exist once the likes of Adam Cole and others debut. Each time I write one of these previews, it’s usually something like ‘Asuka is the best’. So, Asuka is the best. There is a strong argument to be made that she is the best NXT signing, possibly ever. Completely dominant and tone-perfect in whatever role she plays, Asuka truly is the best performer on NXT, and maybe in the whole company period. She has the winning streak, she’s beaten everyone, and there is nothing left for her to do. There are arguments that the NXT women’s division needs her to anchor a thin division. But with Ember Moon, Nikki Cross, Ruby Riot, Peyton Royce, Billie Kay and the potential signings from the Mae Young Classic, the division will be just fine if she moves on. So, what’s up with this match? Do we care? Kind of? I guess? I’m pretty into Moon not being a supernatural wolf/warrior/thing/whatever and just being a wrestler. Her in-ring talent is never in doubt, but the character and mic work is what is holding her back. She’s shown signs of improvement over the last few episodes of NXT when given time, but her work pales to even lower card acts like Royce/Kaye. There has never been someone like Asuka in NXT. Usually, you can see the ‘next champion’ or the logical progression of someone up the card. But with someone like Asuka, who is the overpowered, fully leveled up superboss of an entire division, is it ever going to feel like someone can beat them? Nope. It will never feel that way, but she can’t stay in NXT forever...just like Monday Nights can’t have the same four women wrestling each other every week, right? If they do decide to keep the belt on Asuka, they should absolutely let her go to Raw with it and use the Mae Young Classic to determine who gets to face Ember/Ruby Riot/Nikki Cross for the belt at the next TakeOver. As is often the case with Roode’s matches during his title reign, or his entire NXT tenure honestly, this is the match I’m least looking forward to. I think that all of his matches are fine, but they have a finite ceiling, kind of like a low-rent version of Randy Orton who wrestles exactly like peak-era HHH. You know just about what you’re going to get out of a Roode match and it's usually good, but I get excited for matches that could be great. That said, I wonder if someone like McIntyre is just the person to get that match out of him. Their styles seem to mesh well from every aspect, so hopefully they can put on something memorable. I would tend to think so considering this is McIntyre’s return to the company from a ‘Live Special’ capacity. What I love the most about McIntyre, and what shows how comfortable he has gotten as a performer, is that he is doing a version of his gimmick from his time in EVOLVE, but doing it completely as a face. In EVOLVE, he was trying to ‘save’ it, to rebuild it in his image and now he is trying to take back ‘our NXT’ from Roode. His promos have been great and his ring work is beyond impressive; he really is the guy to be the face of NXT, something that hasn’t existed since Finn Balor. Sure other guys have had the title, but it was Balor that was associated with the brand most heavily. It was Finn you thought about when you thought about NXT. Drew has the chance to be that guy. The great thing about McIntyre's current character is that it can flip between face and heel immediately depending on who the next challenger is. He just flips from our NXT to MY NXT and it’s an instant tone shift. If you couldn’t tell, I absolutely love what they are doing with him since his return. Should he take the belt here? Probably not. My favorite thing about NXT is that no matter when you predict or project a result, you also have to think about where the characters go moving forward. Roode doesn’t need to be on the main roster, and losing the belt here would hurt him tremendously. Let him retain, but not cleanly and then let Drew win the belt and have him be the face that moves NXT into 2018.